Northants strengthened their position in the 30 overs that were possible on the second day of the Specsavers County Championship match against Sussex at Arundel. Captain Alex Wakely batted through the morning session for his unbeaten 46 as Northants reached 142 for two, just 36 behind Sussex’s first innings 178. Rain set in during the afternoon and got steadily heavier and umpires Ben Debenham and Steve O’Shaughnessy abandoned play for the day at 5.10pm. Northants lost just one wicket in the action that was possible when Ajmal Shahzad had opener Ben Duckett caught at second slip by Chris Nash for 72 driving at a ball well-pitched up. Duckett’s innings lasted 113 balls, and he hit nine boundaries. The left-hander had added 94 for the second wicket with Wakely, and he took his first-class aggregate to 790 runs with his sixth half-century of the season. Wakely had a scare on 17 when he edged Steve Magoffin just out of the diving Nash’s reach, but otherwise batted solidly in difficult light. Wakely was joined by Rob Keogh (10 not out) in an undefeated third-wicket stand of 26 as Northants reached 142 for two at lunch when the rain arrived. 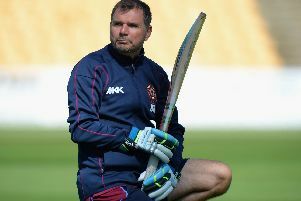 Northants will be hoping the weather eases on Friday so they can try and make the most of their strong position.